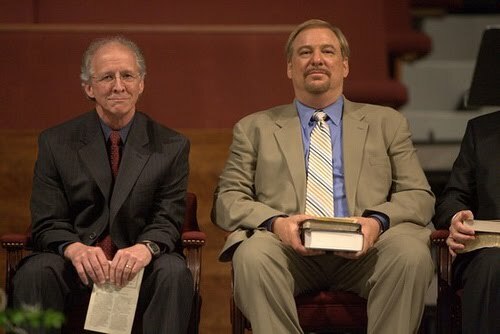 Things took another decidedly odd turn recently when John Piper announced that he was inviting Rick Warren, Pastor of Saddleback Community Church and author of The Purpose Drive Life, to speak at his 2010 Desiring God Conference this October (other speakers include folk one might expect like Al Mohler and R. C. Sproul). Many are baffled by this decision. For one critique, read Tim Challies's post "Why John Piper Should Not Have Invited Rick Warren." For another, read the comments by Michael Horton. Piper has pushed the envelope in recent Desiring God sponsored conferences by inviting controversial speakers like emergent church pastor Mark Driscoll and Federal Vision proponent Doug Wilson (see R. Scott Clark's post "A Gentle Rebuke to Brother John"). Many think that inviting Warren is going too far. 2011: Joel Osteen. I hear he's been reading the works of Jonathan Edwards. Or, it might have been "John Edwards" (?). 2012: Pope Benedict. This choice will really test the whole fundie obsession with "second-degree separation." You know, if Piper invites the Pope to his conference does this mean you can no longer--like--hang out with him? 2013: Bishops Gene Robinson and John Shelby Spong. Inviting these two will extend an open hand to those in the Anglican communion and challenge all our stereotypes.